Missouri Attorney General Josh Hawley and U.S. 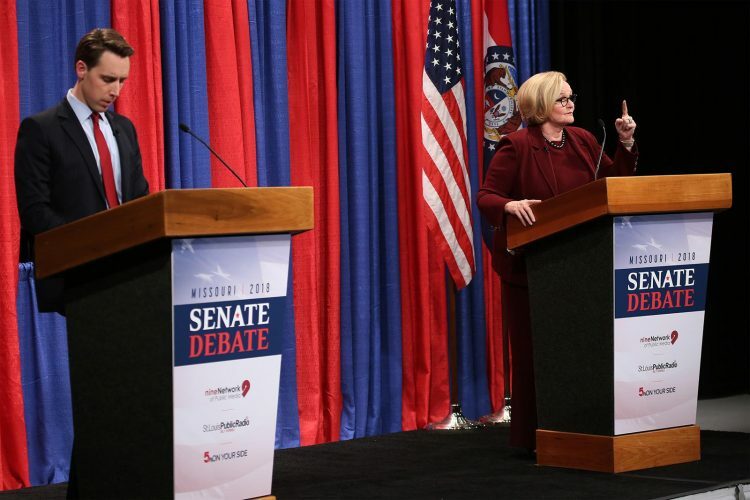 Senator Claire McCaskill debated in St. Louis. The 2018 midterms were atypical for several reasons – not only were they the most expensive midterm elections in United States history but voter numbers were record-high as the Democrats took the House and the Republicans retained control of the Senate. Locally several ballot initiatives were passed, records were broken and new representatives were elected as several incumbents were voted out of office. In Missouri Josh Hawley (R) defeated incumbent Claire McCaskill (D) to represent the state in the Senate. 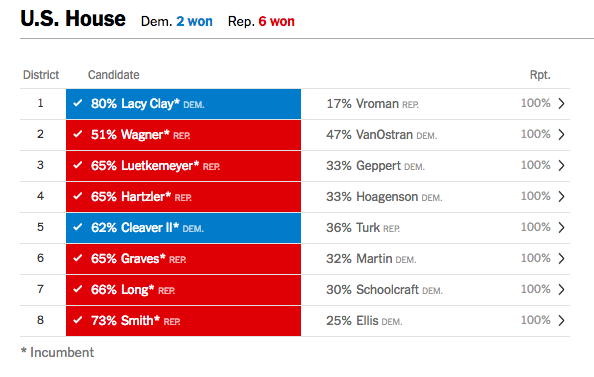 Support for Hawley, who received 51.5 percent of the vote came mostly from rural areas, whereas McCaskill – who received 45.5 percent of the vote – fared better in cities. 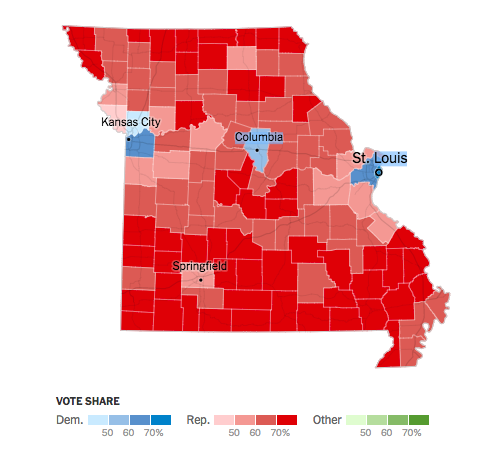 Map of Senate election results in Missouri. Courtesy of The New York Times. A self-proclaimed “constitutional conservative,” Hawley has served as the Attorney General for Missouri since 2017 and has built a reputation as an advocate for religious liberty and reduced government. Hawley has been involved in lawsuits against several prominent companies, including search engine Google and drug companies Purdue Pharma, Endo Health Solutions and Janssen Pharmaceuticals. Endorsed by a number of conservative groups – including the Senate Conservatives Fund, the Tea Party Patriots Citizens Fund and the National Rifle Association, Hawley is a strict believer in traditionally right-wing ideals. Hawley believes both the Affordable Care Act and abortion are unconstitutional and that human trafficking can be blamed on the women’s sexual revolution of the 1960s. He has been endorsed by President Donald J. Trump and has vocally supported the current administration’s actions, including implementing a child-separation policy at the Southern border, the impositions of trade-tariffs and the appointment of Brett Kavanaugh to the supreme court. Hawley will serve on the Senate as the representative for Missouri for the next six years and will be up for re-election in 2024. He will serve alongside Roy Blunt (R-Mo. ), who will be up for re-election in 2022. Within Clay County, in which William Jewell College is located, several ballot initiatives passed. Amendment 1 passed with 62 percent of the vote – thereby restricting the value of campaign contributions that candidates can accept from individuals or entities and mandating that legislative records and proceedings be open to the public. With 65.5 percent of the vote, Amendment 2 passed legalizing marijuana for medical purposes with a 4 percent tax. Revenue collected from this tax will be dedicated to health care services for veterans. While Amendment 2 passed, Amendment 3 and Proposition 2 – both seeking to legalize medical marijuana – both failed. With 52.4 percent of the vote, Amendment 4 passed removing language limiting bingo game advertising and enabling members of licensed organizations to manage games after only six months, as opposed to the currently enforced two years. Proposition B passed with 62.3 percent of the vote, decreeing that the minimum wage will be immediately raised to $8.60 and increased by 0.85 cents per hour annually until 2023, when the state minimum wage will be $12.00 per hour. This proposition also exempted government employers from the wage increases and increased the penalties for paying employees less than the minimum wage. Proposition D, a 2.5 cent per gallon gas tax to be imposed for four years beginning July 1, 2019 to raise money to prepare roads within the state, failed to pass with only 46.4 percent voting in favor. The Senate seat in Kansas was not up for grabs in this year’s midterm election and incumbents Pat Roberts (R) and Jerry Moran (R) will be up for re-election in 2020 and 2022, respectively. The election of Sharice Davids (D) from the third district broke records as – along with Deb Haaland (D) from New Mexico – she will be the first Native American woman elected to Congress. Additionally, Davids is the first openly LGBT member of Congress elected in Kansas. In a contentious race, Democrat Laura Kelly was elected as the governor of Kansas, defeating Republican nominee Kris Kobach. Incumbent Sam Brownback (R) was unable to run for re-election due to term limits, however, he may run again in 2022. Incumbent Derek Schmidt (R) was elected to be the Attorney General of Kansas with 59.3 percent of the vote, Scott Schwab (R) was elected to be the Secretary of State with 52.9 percent and incumbent Jack LaTurner (R) was elected to be the Treasurer with 58.1 percent. No measures were listed on the Kansas ballot in this year’s midterm election. Photo courtesy of Carolina Hidalgo/St. Louis Public Radio.